The most important thing to a sucessful breakout is the first pass and the timing. Young players have a tendency to get too far ahead of the play and therefore make the first pass for the defense difficult. 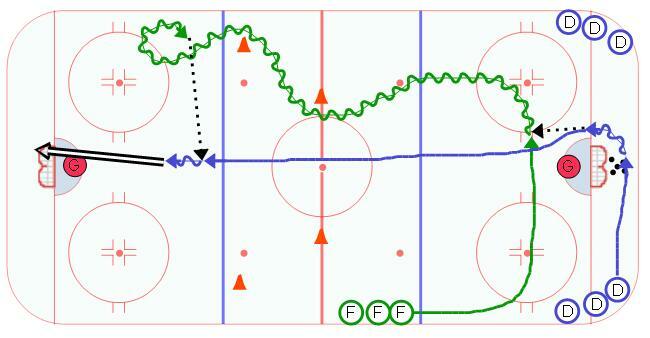 This series of breakout drills focus on the first pass and the timing of the forwards. In this first drill, the defense starts in the corner on the same side as the forwards, who are line up just outside the blue line. The defense picks up a puck from behind the net and make a pass to the forward swinging through the slot area. The key here is the timing of the forward. If the forward is too far ahead of the play, the pass is impossible for the defense. The whole idea is to create options for the defense. The more options given to the defense the more success rate you will have. Once the breakout pass is made, the forward works on their inside out move through the neutral zone and performs an escape move just inside the blue line. The defense, after making the pass, follows the play and expects to get a return pass just inside the blue line.